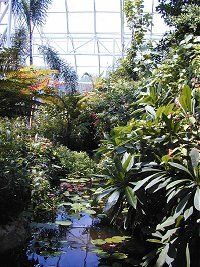 The tropical conservatory is the heart of the Butterfly House. Its carefully controlled environment houses nearly 2,000 tropical butterflies in free flight. 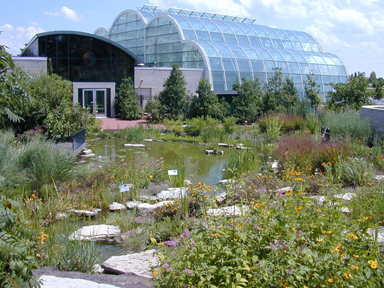 As many as 80 butterfly species and 150 tropical plant species are exhibited. Few moments in nature are as magical as watching a butterfly emerge from its chrysalis. This rarely seen transformation becomes an everyday occurrence in the "Miracle of Metamorphosis." Hundreds of chrysalides from around the world are on display with butterflies emerging before your very eyes. The Monsanto Teaching Pavilion sits in the Butterfly Garden and provides a favorite location for many weddings. Overlooking the Butterfly Garden to the north and the reflecting pond to the south, the Emerson Lakeside Terrace is a multi-use patio that hosts weddings, receptions, corporate events, and black-tie galas. For information on private events at the Butterfly House call (314) 577-0888 ext. 3. The Exhibit Hall is where you'll find Small Wonders, a living exhibit focusing on the habitats and lifestyles of various invertebrates, as well as our immersive dome of Orange-headed Cockroaches. 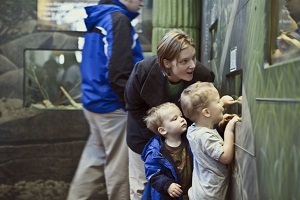 Don't miss the Butterflies of the World exhibit to get a glimpse of butterfly diversity. For our younger guests, we have Caterpillar Corner and the Exploration Station which have a variety of interactive playthings. The children's video, Butterflies, is also shown continuously in the hallway. Our gift shop offers something for everyone in an atmosphere brimming with souvenirs, educational toys, books and unique gifts related to butterflies and the natural environment. Proceeds from the shop support the continued operation of the Butterfly House. The Emerson Family Theater shows The Butterfly Effect at various times throughout the day. Check with admissions for daily movie times. This 17 minute original film is an engaging introduction to butterfly behaviors and anatomy. Overhead a graceful arch heralds the beginning of a magical experience. Underfoot, the plaza is constructed of butterfly-shaped paving stones. Many of the stones, inscribed with personal messages, tributes, and memorials, are gifts from families and individuals. There is still space to add your family milestones. A 30-foot long caterpillar sculpture sits among native prairie plants just outside the entrance. It was created by artist Bob Cassilly and presented to the Butterfly House by Lucy and Stanley Lopata. Surrounded by seasonal gardens, this sculpture presents a great photo opportunity for families. 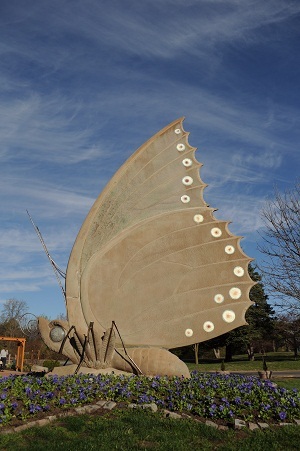 The 28-foot tall butterfly was created by St. Louis sculptor Bob Cassilly and given to the Butterfly House by Rosemary and Joe Shaughnessy in honor of their grandchildren.